What could be done? The politics of conflict-resolution – Yugoslavia - What Should Have Been Done? A Conference on Security and Cooperation in Southeast Europe, CSCSEE, UN and OSCE-sponsored, modeled on the Helsinki process, with all concerned parties (also sub-, super- and non-state), with all relevant themes on the agenda; possibly lasting 3-5 years. Outsiders to the region should only be present as observers with right to speak, there being no disinterested outside states. One possible long term goal: A Southeast European Confederation. – Bosnia-Herzegovina as a tri- or bi-partite federation; with the right of any party to self-determination after some time. – Macedonia: a Macedonian federation should not be ruled out, but can only emerge within a broader setting. – Ex-Yugoslavia: long-term goal a Yugoslav Community, like the Nordic. Increase UNPROFOR by an order of 10, or more, with 50% women, creating a dense blue carpet to supervise truces and to stabilize the situation. The soldiers must be adequately briefed and trained as conflict facilitators, working together with possible civilian peacekeeping components. Avoid big power participation. A dense network of municipal solidarity with ex-Yugoslavia, for refugees, COs, relief work, reconstruction: Cause Commune, Gemeinde gemeinsam, with the able assistance of Council of Europe. Let 1,000 local peace conferences blossom, support local peace groups with communication hardware, organize dialogues, let people’s ideas flow together in a pool of conflict insights. International Peace Brigades as Hostages for Peace, unarmed foreigners living in threatened areas, dampening the violence. Intensify ecumenical peace work, building on nonviolence and peace traditions in Catholic and Orthodox Christianity, and Islam. Permanent contact among persons, groups and states working for peace within the state system (-), municipal system () and civil society system (-); letting ideas flow. Have a “Peace Ladies Conference” parallel to the London/Geneva conferences among War Lords inside and outside ex-Yugoslavia. Demand professionalism from the media, less bias, violence and elitism; more focus on common people and peace efforts. – have inside and outside specialists search for an understanding of what went wrong, and for positive past and present experiences that can inspire a common, even if more separate, future. Jedinstvo, unity is out and was maybe never in. But much bratstvo, brotherhood, remains. Realistic? probably considerably more than realist politics of strength. For a new start the format of the Helsinki conference (CSCE) 1973-75 – one of the rare successes of the state system in the Cold War setting – is probably the most promising. For reasons to be explored below the conference must be open to all interested parties, all themes must be on the agenda. Ample time is essential. But very efficient working groups, benefiting from this more global and holistic approach, are also essential. What is badly needed is a country playing the role of Finland as go-between, disinterested, yet a part of it. The country should be neither Muslim, Catholic/non-Slav, nor Orthodox/Slav. Thus, the elimination principle might point to Romania (non-Slav/Orthodox). Like for the Helsinki conference a neutral, or at least balanced sponsorship should be found, and the best would probably be what came out of the Helsinki conference, under a UN mandate, or with the UN as co-sponsor. The EU or any of the member countries are too much party to the conflict, and will at any rate play a major role regardless of the setting. The Council of Europe and the European Human Rights Court may also play a role. But the basic assumption would be that the future of the Southeast Europe (not “former Yugoslavia”, nor “Balkan”) will have to be work out, as much as possible, by the countries directly concerned. Very important in this connection is not to use conferences to give voice only to extremists because they are in power, as is usually the case in a crisis. Intergovernmental conferences tend to commit this sometimes fatal mistake. In ex-Yugoslavia the overwhelming majority, at least 90% (and higher for the women) are against a war kept alive by a combination of unscrupulous leaders and the resentiment and tremendous violence potential of the male part of the lower echelons of society. – establish a link between state-system and nonstate-system conferences. Obviously, these three approaches do not exclude each other. The strength of a multi-lateral, multi-issue approach, with sufficient time at the disposal of the participants, is the foundation for a conference of this type. The worst conflicts to solve (transcend, transform) are of the (2,1) type, two parties quarreling, fighting, over one issue. There is almost no room for bargaining, only for withdrawal or compromise. But in human and social reality conflicts are always of the (m,n) variety, m parties and n issues or themes, permitting a lot of bargaining given some time and imagination, exchanging one conflict for the other. The tragedy, however, is that in the heat of a conflict, reductionism to the (2,1) type takes place, also known as polarization. This is the type easiest to understand and for that reason preferred by mass media. In addition, Western culture has this type of thinking as a mind-set so it comes almost automatically, and usually with strong evaluations clipped onto the two parties. One is guilty, the other is the victim. One is God, one is Satan. It took the world much time to understand that the conflict in Bosnia-Herzegovina was at least trilateral and that all parties were guilty of hideous violence. And the world seems still not to have understood that the initial conflict in Croatia was also trilateral (Zagreb, Belgrade and the Serbs in Croatia; even that being a grotesque simplification); with an everlasting, ongoing, Titoist-Chetnik conflict as a part of it. And the Chetniks so far (2006) as the winners! In a deeply rooted conflict the parties sit deeply anchored in their hatred and polarized images of reality. And yet it is probably by the Croats conceding something to the Serbs on Croat territory and the Serbs something to the Albanians on Serbian territory, that progress can be made. Having said this, it is also clear that if the Albanians could concede something to the Croats, then some trilateralization might be possible. Or, more realistically: quadrilateralization. 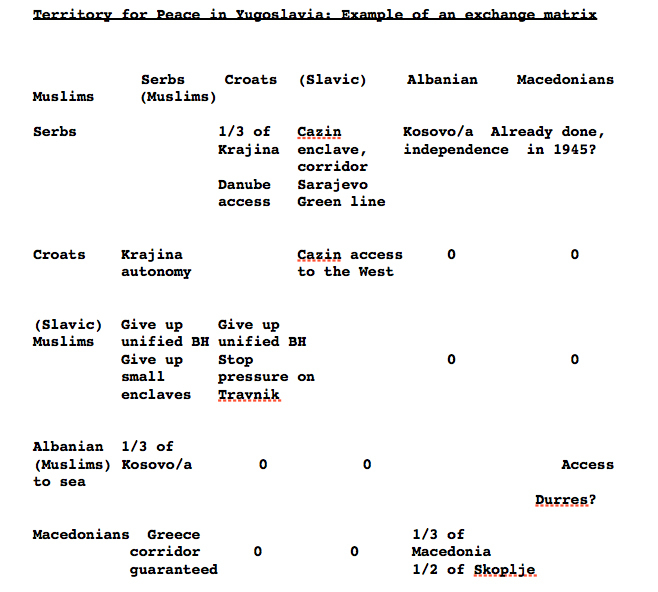 The Albanians concede something to the Bosnian Muslims, and the latter something to the Croats, closing the cycle of concessions. For this time is needed, perhaps also conflict facilitators. The latter, however, definitely must have no interest in the conflict, and that rules out an EU dominated by its Five Big (all with histories of interventionism), and Germany in particular. A military enforcement action, air, ground or both, “with all necessary means” (SC Resolution 678, legitimating the Second Gulf war) will cost very many lives, and add to the traumatisation and hatred that will fuel future wars (including against the UN: cops who do much killing tend not to become popularly accepted). Sending troops from any country that has exercised in the past some kind of outside intervention in Yugoslavia is a major mistake, and that includes not only Germany and Austria/Hungary, but also England, Italy, France, and the USA and Russia. Trigger-happy troops should be avoided (like Pakistanis in Somalia). But leaving this aside there is no doubt that a case can be made for military intervention to save lives. The present policy triggers violence and does nothing to stop it. Either trigger no violence or stop it; the question is how that can be done without violence breeding even more violence, now or in the future. – preventive deployment; which is what should have been done in Bosnia-Herzegovina in April 1992, in time for the (/too/ “early, selective and uncoordinated”, to quote the letter to Genscher from Javier Perez de Cuellar of 14 December 1991). Kosovo/a and Macedonia would be obvious places for preventive deployment. – creating a “blue carpet”; in other words, so many blue helmets that a mass effect arises, a “transition from quantity to quality”. However, UN troops only retain an aura of invulnerability as long as they themselves do not practice any large scale violence, and they should definitely be much better briefed and trained in nonviolent ways of handling conflicts than has been the case so far. A substantial proportion might be women. These two approaches by no means exclude each other, but should preferably be practiced conjointly. This municipal solidarity is already proceeding and should be strengthened. Very important is the avoidance of paternalism (the word “adoption” should be avoided). Respect for the Yugoslav side; in general they will probably know better how assistance can most usefully be applied to the desperate situation. On the other hand, the outside is also entitled to make sure that there is no waste or even corruption; both of them likely to follow in the wake of such efforts in a major crisis. Such political processes as the “London Conference”, and the media focus on the political elites in general, privilege the extremists who stand for cultural purity or dominance one way or the other. They may sabotage such conferences when the general Yugoslav population just wants one thing: not necessarily status quo ante, that may be too late anyhow, but peace, rebuilding the countries, reconciliation, getting started again. They should be encouraged wherever they are. Many of them are abroad. Some of them, belonging to the old ruling class, sit in their apartments in Belgrade, Zagreb or Split, trying desperately to figure out what happened to a Yugoslav construction working so well on the surface. Many still insist on being referred to as “Yugoslavs”. One of the best investments in a peace process would be to help those who oppose the war in their effort to dialogue with fax machines, computers/modems, etc., and for heaven’s sake by not adding to economic sanctions communications sanctions against rest-Yugoslavia. People have ideas, the problems is how to promote communication and visibility, inside and outside Yugoslavia. There is room for civilians, from the outside, in all these operations, provided they are not a burden on the local population already under tremendous stress and strain, and provided they have a specific function (like engineers, medical people). They could come in connection with ,  or  above, complementing the military peace-keeping. An interesting point comes up very quickly: assistance to, or even presence in, the part of ex-Yugoslavia hit by the (selective) sanctions. Relief to people yes, but would assistance in reconstruction, however useful as a sign of solidarity relinking rest-Yugoslavia to the outside world, be compatible with the transformative/punitive hypotheses underlying sanctions? Would this be a reason for a country not to be member of the United Nations? Sooner or later these questions will be asked, and the answers are by no means obvious. The national groups in ex-Yugoslavia are often identified religiously, which does not mean that they are strong believers or that the conflict is over theological dogma. Rather, many follow Blaise Pascal: the consequences of not believing in a God that exists are worse than the consequences of believing in a God that does not exist: he may punish you for not standing up against the enemy. Religious institutions were heavily instrumentalised by political leaders, but such tactics would never have worked if they had not fallen on a soil of hatred and centuries of divisiveness clarifying who shall kill whom. There is an enormous amount of ecumenical work to be done among the three branches of occidental Christianity, and it is never too late to get started. The Dalai Lama could possibly work as an “honest broker”. The problem with the Pope is, of course, similar to the problem with EU/Germany: a party to the conflict. It is strange that in our era of excellent communication there should be such a paucity of contact between the forces presumably working for peace. For the various anti-war committees, and whatever is left of free press in ex-Yugoslavia part of the explanation is economic, much of it due to the war itself making communication difficult. Sanctions against rest-Yugoslavia make it very difficult to establish contact with the peace forces. This isolates them and leaves the public stage to nationalist extremists. But there is also another factor at work: the state-system and the nonstate-system do not trust each other. Neither of them have much to show for themselves. To the extent the state-system has been EU-dominated, in this case meaning Germany-dominated (and behind that the Vatican and Austria), the role played has been highly counter-productive, against the strong warning by then Secretary-General of the United Nations, Javier Pérez de Cuéllar. But if those who are strong have not been doing the right thing and those who think they are on the right track (whether they are called the peace forces, civil society, the people-system or what not) certainly are not strong, they should at least cooperate. The epitomy of tragedy would be open conflict, not only lack of communication between those working for peace on parallel tracks. The media inside and outside Yugoslavia have been with almost no exception (Der Spiegel?, The Independent?, The Guardian?) bad, pouring gasoline on the fires from the very beginning. Would the foreign media have done so in their own country, or is there also a factor of contempt, bordering on racism, for “the Balkans” at work? At any rate, it is never too late to start training courses for journalists, including using the better of them with Yugoslav field experience as resource persons. And a permanent jury, for instance coming out of the Verona Forum, could distribute praise and blame, issuing a weekly bulletin, recording major mistakes. Prizes would be useful, and they could focus not only on investigative reporting, but also on peace reporting. The WarReport, published by the Institute for War & Peace Reporting (formerly Yugofax) might be a good forum. The press itself would hardly be an appropriate judge in such matters. The twin ideas of sanctions and a war crimes tribunal grow out of a mind-set where sin-guilt and penitence-punishment play a dominant role, in other words the Christian-legalistic mind-set. Without in any way denigrating the importance of these approaches at the micro-level of ordinary human day-to-day behavior and in domestic (municipal) law, serious problems arise when applied to collectivities like nations. The norms and values appealed may encounter positive resonance under more ordinary circumstances. But when fully mobilized for national/cultural conflict, the leaders and many or most of their followers see themselves as duty-bound by even higher forces, related to their historical myths. In former Yugoslavia this applied to all groups. In addition, there is the revenge for traumas suffered in the past, not to mention the present and the very recent present, and how to prevent such horrors from revisiting them in the future. “Secure borders”, in other words. But are secure borders geographical, or are they somewhere in the mind? And in that case, can they be opened up, guided by ideas of tolerance, dialogue, even mutual learning? The Serbs, but also some of the other nations, will add to this a sense of being the outcast, the scape-goat; very unjustly being made responsible for the outbreak of the First World War, by people curiously ignorant of the Austrian occupation of Bosnia-Herzegovina in 1908, the type of event that normally fosters a resistance movement. The megalo-paranoid collective person all of this has fostered, encountered not only in former Yugoslavia, nor only in Southeast Europe for that matter, will interpret sanctions and tribunals, particularly when they alone are singled out for such attention, as one more confirmation of key parts of their world view. Sanctions will harden them. The last “moderates” may disappear, the real hardliners may come into power, making the reasoning behind the sanctions/courts a self-denying prophecy. The outside will be blamed, not the leaders. The economy will suffer serious decline. The agricultural base is rich, however, and small-scale industries and large-scale smuggling will emerge quickly. The problem is that such measures are not easily withdrawn lest that looks capitulationist or similar acquiescence. Moreover, lack of “success” may strengthen the voices arguing full-scale military intervention, with “bombing Belgrade”. There is also a lack of understanding of the level of autonomy in a peasant army, essentially guerrilla, and essentially run by the lower echelons of society: any capitulation high up or far away may be irrelevant. Intervention will lead to occupation which will lead to endless guerrilla fighting (at a much lower level Somalia may perhaps serve as an example). For many of the peoples of Yugoslavia this would be only one more chapter in a history of at least 600-900 years of outside intervention, usually also with some noble purpose like evangelizing, civilizing, pacifying, modernizing &c the backward. In no way does this mean that the world community should not strongly express its condemnation of the atrocities. There are ways of doing this without invoking the criminal law analogue in its entirety. But the problem is that the generally propagated construction of Yugoslav reality with the Serbs cast into the role as the only guilty does not hold up against facts, at the same time as it would be ridiculous to put the blame only on those who launched the first act of war (the Slovenes) or the first act of “ethnic cleansing” (the Croats). Much sanctioning, intervention, bombing (of Belgrade and of Zagreb) and sentencing will have to be carried out if this punitive mind-set is to be enacted completely, and will very quickly lead us in absurdum, destroying what should be preserved. The very opposite of this approach would yield much more of a “peace dividend”: engage experts, among them historians from all sides, and analysts of the very recent past, to arrive at an explanation of what happened, and then look for past and present models that can give some hope to Yugoslav peoples so badly treated by a cruel history. This work should proceed parallel to the conference mentioned in  above, and make inputs into that conference, and unfold in close cooperation with the conference mentioned under  above. – the Christian/legalist mind-set may criminalize political action, e.g. as lack of respect for the established order so much that no space is left open for any alternative, like the use of peaceful means for national autonomy. But so far we have seen more journalism than professionalism. – Albania might give Slavic Muslims a free port in Durres in return for industrial cooperation. Low level of violence, disinterested and skilled mediators, sufficient time for the process.